This page is part of the site located at http://freepages.genealogy.rootsweb.com/~sheboygan/ There is no charge or fee to access this site or any information on it. If you have arrived here from somewhere else, such as a pay site, and are in a frame, you can click the above url to access this page directly. This is a real photo postcard, with a divided back of the Steamer J.H. 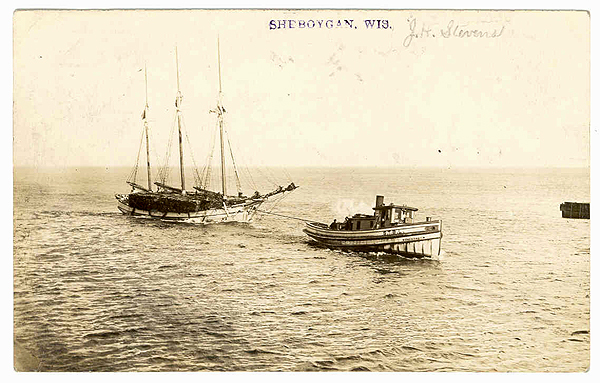 Stevens being towed into port in Sheboygan, Wisconsin. The vessel is being brought in by the Sheboygan Tug Boat Lines Satisfaction. The Stevens was built in Detroit during 1866 and converted to steam in 1895. She burned off the coast of Presque Isle, Michigan in 1927.